What does the V in your name stand for? Vivacious? Voluptuous? Actually my real name is Beethoven Bunagan. My favorite artists happened to be Michael Jackson and Gary V, great singer-dancers both. So my screen name is an amalgamation of both their names. Didn’t you use that style to match the antics of rapper-actor Andrew E? That was one of the factors. We were looking for a catchy name and what was in then were names with abbreviated surnames --- Andrew E, Francis M, Gary V, MC Hammer. 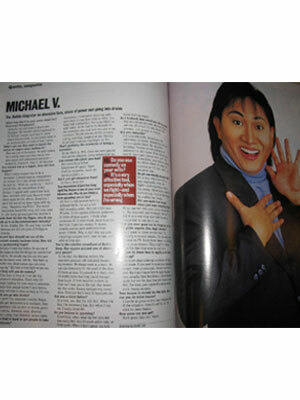 Aside from the late Jay Ilagan, who do you look up to in the entertainment industry? To me, Dolphy, Tito, Vic, and Joey, the Bad Bananas are still the gods of Philippine comedy. You and Ogie Alcasid are one the funniest comedy tandems today. How did your partnership begin? Actually I hated him before. He was one of the judges in that Eat Bulaga rap contest that I lost in. He actually was the one who gave me the lowest score. Sabi ko, ’ang kapal ng mukha nito. Hindi naman siya marunong mag-rap!’ But look at how tight we are now. How long will you do comedy? I’ll be here as long as U can get the audience’s attention. That’s why I’m always looking for new ways to entertain, things that people haven’t seen before. Going extreme is okay as long as it’s new. Do you find it hard to get people to take you seriously? Sometimes. I remember my wife gave birth to our first child in 1994. Our baby had a retraction; his lungs filled up with water so he had to be brought to the intensive care unit and was put in an incubator. People saw me at the nursery crying, and they laughed at me. Feeling ko parang hindi tao ang tingin sa akin. That’s probably the downside of being a comedian. So far, that’s it. Well, there are some people who get too physical, iyong nakakasakit na. Do you use comedy on your wife? It’s a very effective tool, especially when we fight – and especially when I’m wrong.